The skyline of Colombo city is looking more impressive than ever, thanks to the presence of a pair of extraordinary towers which gives the impression of one leaning on the other. This architectural masterpiece is a 240m skyscraper known as Altair, a project by Indocean Developers (Private) Limited which is a venture of South City Group, bringing together over 150 years of cumulative development experience. The unique twin tower condominium has been designed by Moshe Safdie of Safdie Design, who was also the architect for the Marina Bay Sands in Singapore. The residential and commercial project is set to smash the record for Colombo’s tallest residential building and is designed to be a game-changer in terms of real estate development, architectural design, structural engineering and living experience. Altair, with 68 levels and 63 levels, respectively, is the centrepiece in the crown of Colombo’s residential apartments. What’s interesting about its structure is that it is oriented to the movement of the sun and to maximise airflow in the tropical climate, while offering its residents a 270-degree views of Beira Lake and the Indian Ocean. Situated adjacent to Beira Lake on 2 acres of land at 121 A, Sir James Pieris Mawatha, Colombo 2, Altair promises its residents 270 degree unobstructed views of the lake and the Indian Ocean. The building features include over 400 luxury apartments and will also have a Sky Garden on the 63rd floor which is designed to make anyone feel on top of the world. Cool off in the extensive infinity pool that’s been designed to merge visually with the Indian Ocean and makes for an interesting swim. This condominium offers uninterrupted views of the city, sea and lake over a relaxing drink at the bar in the lounge or live it up with your friends and loved ones in the area that will be known as the perfect party venue! Based on Sri Lanka’s location the country is rarely exposed to hazards like earthquakes. However, the country is still prone to experience earthquakes that can take place along the Indo-Australian tectonic plate. Though the Colombo city is recognized to have zero chances of experiencing major earthquakes, Altair is constructed to withstand high earthquakes up to 7 on the Richter scale to ensure maximum safety. That’s not all: The Urban Development Authority (UDA) plans to convert part of the street into a pedestrian-only promenade to facilitate the 40,000 sq. ft. high-street retail shopping arena where ground-floor shops will line a lakefront pedestrian promenade, with restaurants on the mezzanine level overlooking the promenade and will house leading international brands, restaurants and supermarkets. The leaning tower has been designed using a distinctive diagrid structure with flat slabs which not only adds structural stability to the building without the need for internal columns, but also allows for a permeable surface with large windows. This allows maximum natural light enter into the space making it even more sustainable. The apartment towers are constructed on reinforced concrete piles and a raft footing with a reinforced concrete and steel superstructure. 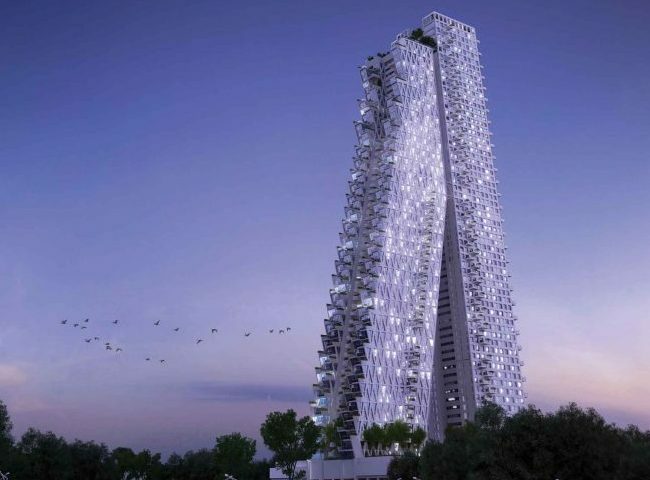 The tower will undoubtedly set new standards for all future luxury condominiums in Colombo. It is eligible to compete against other global luxury developments with features such as renowned architect, water views, prime city location, upmarket shopping precinct, lavish penthouses and a rooftop terrace with an infinity pool. The urbanization boom in the city resonates louder than ever before, and now is the time to avail yourself of the chance to live not just in a centrally-located neighbourhood with a breath-taking vista from right outside your window, but many other possibilities beyond your wildest dreams.